I wish everybody could have been there. At the Casa Tra Noi near the Vatican was just held the bi-annual meeting of Una Voce International. It was a time for handshakes, prayer and discussions. The abiding faith of the delegates and observers, conversations, meetings, holiness and prayer were a source of great inspiration to all. A common theme was: the salvation of souls is the highest law and so lets save souls with what the Church has given to us in Her wisdom: the extraordinary form of the Roman rite. 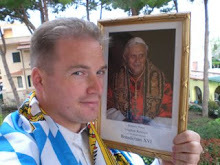 All the news was upbound: the continued buildup and support of the movement has been furthered with this summer's Summorum Pontificum and an even greater and younger base of support is being seen within the movement. The news is we are growing and so join us at http://www.unavoce.org/ . Noi proteggiamo le cose più care. Very nice pictures. It was good to have met you in Rome! There are now also some pictures from Rome on my blog. Huge Tridentine rite Mass to be sung in Rome..
A Roma folla di tifosi per la tiara! See you in the Land Down Under..